When I write Ma, it rhymes with what sheep say, rather than rhyming with the word that is a long, long way to run from that Julie Andrews song. Now if that’s a very roundabout way of explaining things then good, that’s the intention. Being Irish isn’t as easy as you think you know. In this year and more specifically this Easter, we commemorate 100 years since the Easter Rising of 1916 when Ireland although not gaining immediate independence, started out on the road to becoming a republic as a result of the events of that week of rebellion (in most people’s eyes). I for one think the importance of the date is exaggerated through the rose tinted glasses of history. However due to its significance in the Irish psyche, if that’s not an occasion to look at what being Irish means to me as a writer and as a person, I don’t know what is. My mother, or ‘Me Ma’, as I would have said growing up, had a profound influence on me. Neither of my parents were particularly religious. They more hung onto it in a just in case way, rather than rammed it down our throats. The same applied to their notions of nationalism. While we are undeniably linked to our deep traditions, culture and heritage, my parents kept us well clear of the sectarian bitterness that divided the northern part of our little Island. When I write it is from a uniquely Irish perspective but not necessarily about things Irish. In fairness there is a good whiff of the Irish about all my books, but not exclusively so. Little Big Boy is very much set in the Ireland of my childhood so hands up on that one. Larry Flynn is a curmudgeonly old Irish rogue and the setting is Irish but you only have to look at the cover to see the stars and stripes to understand there is an international element to the tale. It is something that comes from the notion that you should write about what you know. 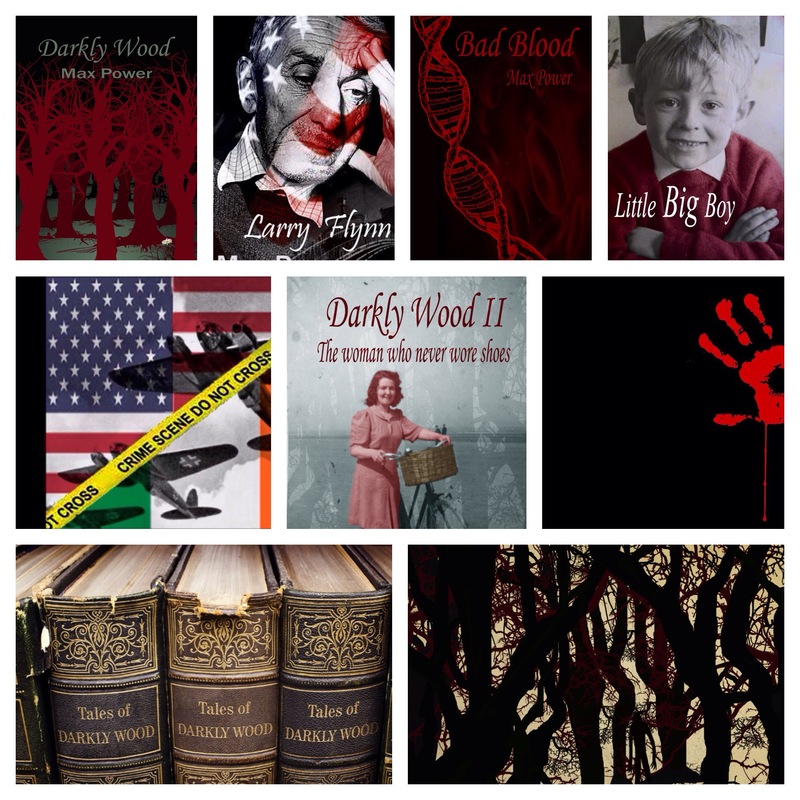 Bad Blood crosses the Atlantic a few times and while Darkly Wood is certainly not set in Ireland, I did manage to sneak in an Irish character along the way. Being Irish is I suppose about the things we have in common but also the small things that separate us. Today is ‘Good Friday’ and while many of the old Catholic traditions have fallen by the way side, you still cannot buy a pint in a pub today and there are plenty of people who will refuse to eat meat. The whole Easter period for me as a child was focussed on a religion I was forced to adhere to but nonetheless, the memories are a large part of me. The Stations of the Cross, religious processions, Palm Sunday and most important of all, Easter eggs. Until recent times the Easter Bunny didn’t exist in Ireland. We had aunties. My aunties would all deliver a chocolate egg to us in advance of Easter and we would neatly stack them and stare at them all week before Easter Sunday. Jaysus it was torture. Me Ma wouldn’t let us touch them, although I used to carefully open one or two and sneak the sweets from inside out before carefully putting the egg back together again. If she’d caught me … I daren’t think. After Mass, it would be back to the eggs but by then it was getting close to dinner time so all we could have after much negotiation was half of one egg. It was torture. My whole Easter Sunday was spend negotiating how much of the next egg I could eat before dinner or tea, until bed time. They say moving house is stressful. Try being eight years old in a house full of chocolate that you can’t eat. This Easter, we remember 1916. 100 years ago, a largely Dublin centric rebellion set in motion a chain of events that ultimately led to the war of Independence culminating in the formation of the Irish state in 1922. It is an odd thing, because at the time it was largely unpopular with the citizenry of Dublin and indeed most of the casualties were civilians, followed by a high number of British soldiers and relatively few rebels. For those unfamiliar with Irish history, the ridiculously short version prior to Independance is 800 years of British oppression, an horrific famine in the mid 1800’s that saw millions die or emigrate, both giving birth to countless 104 verse long songs about the auld sod, a few failed attempts at rebellion coming to a head in 1916, when at the end of the vicious street battles and destruction of many landmark buildings, the rebels leaders were executed. It has been argued that had the leaders not been made martyrs, perhaps things would have quietened down, but the public’s opinion changed when the executions began and when the fight was widened in subsequent years and the British began to use more and more desperate measures to quell the unrest, such as the use of the notorious Black and Tans, the tide shifted to such an extent that a truce was arranged, a treaty was signed and Ireland was given Independence for 26 of its 32 counties, with six counties of Ulster being retained as British due to the loyalist support in that region. What kicked off again in the 1960’s that led to the so called troubles was a direct result of that partition. Now, leaving aside all I have left out not to mention the ancient part, St Patrick, the Celts and so on, the version above is about as accurate as I could be arsed giving. Significantly our Independence resulted in the usual civil war and that led to an almost unbroken political two party divide that has only recently been challenged at the polls. Unencumbered by conscience, fear, or the burden of feeling, something moved in the place that sat upon the hill overlooking the village of Cranby. The light near the edge of the wood felt more enticing of late and while he knew he should stay clear of the fringes, the draw sometimes felt almost impossible to resist. Some things never change and for this particular creature of the wood, there was no memory of things ever being any different than they were on that particular, fateful day. But things were different and change was coming. If he could have been able to think back, then it might have seemed more familiar. He might have recognised the signs but he didn’t remember. Change like this had come before and the last time it had been devastating. Cranby was nestled below the wood, separated by the meadow and the small stream that acted as invisible barriers. The reputation of Darkly Wood was as old as the wood itself, but bizarrely that didn’t stop the curious or the ignorant, from tripping along its borders. It should have stopped its next visitor but it didn’t. She sat cross-legged on the grass a slip of a girl, dainty and almost elegant, smoking a cigarette with one hand, holding a book in the other. The accusing tone, was as unattractive as most of his other character traits. Charles Colson Callous bore a mouthful of a name, but everyone simply called him Charlie. He had a whole host of flaws but that was the point as far as Holly was concerned. Her mother hated Charlie so for now, he was perfect. Charlie looked down at Holly sitting on the grass. She was the most beautiful thing he had ever seen and she could pretty much get away with saying what she wanted. Holly flicked her cigarette away and leaned back on her elbows. She looked up at Charlie. “Why don’t you go home to your mother Charlie, I’m going on with or without you.” She quite suddenly scrambled to her feet and stood facing the befuddled boy. “What’s the point of you anyway?” It was an unnecessary unkindness. She turned and tramped up the soft incline of the meadow toward the edge of Darkly Wood and Charlie watched her go. She was mean, sometimes too mean. Holly ignored his needy plea and kept up her pace, forcing Charlie to run to catch up. When he did, she didn’t even offer him an acknowledgement that she noticed. He walked, more followed really, about a pace behind. She finally stopped as they reached the first tree at the edge of the forest and opened her little book. Charlie knew she was looking for something specific in the book and he stood next to her, as if he was reading over her shoulder. In truth, he was looking at the profile of her face. Her hair had loose, mousey curls that no matter how she tried to tie it, always seemed to fall across the side of her face. She twinkled to Charlie. “You’re…you…” He wanted to tell her that she was pretty but he was afraid. It didn’t matter because Holly had already turned her attention back to the book. The sun was high in the sky and it was a beautiful July day, but at the edge of the wood the air felt cooler. Something stirred within and while Holly was oblivious, Charlie glanced furtively into the shadows. He didn’t like this place. Like everyone in Cranby, he knew the stories and while they always seemed a little far-fetched, Charlie believed there was something not right about Darkly Wood. The thing that stirred, that almost caught his attention, had indeed been drawn towards the edge of the wood. There was someone out there that called to him. It had been a long time since he had felt the warmth of companionship and quite suddenly, there was a very strange sense of déjà vu that led him away from the comfort of his lair. He rubbed his head, sniffed the air and there it was, something familiar, something old. A smile crossed his lips. It was a broad happy grin but it was more than that. It was a wicked smile and those that knew the tales of Darkly Wood, those that feared that place for believing them, would never have dared to tempt fate like Holly did on that particular July morning. But Holly was not like the others in Cranby. She was far too new and fresh to the village to have been frightened by its folklore. She was a courageous girl with the soul of an anarchist and the heart of a warrior. The one thing that she lacked, as her mother constantly reminded her, was respect. As she led Charlie up along the edge of Darkly Wood in search of the ruins of Darkly Mansion, her lack of respect was about to land Holly Coppertop in a great deal of trouble. …..